The personal sunk cost fallacy likely has a different dynamic than the organizational sunk cost fallacy. A nice review of a book that attempts to have us further understand the decision making process; will put this on my list of what to read. Bee to tell you the truth I think you are overanalyzing things. You can't guide your brain; be spontaneous. IQs in a committee add like ohms in parallel resistors. The second worst possible decision after a defective consensus is to do nothing, the worst is to do it harder. Those are the managerial defaults, hence the US social services agenda - welfare, law enforcement, finance. I think a lot has been missed by these statements. You do call the work statistical. I stopped at that point and will move forward from there. Maybe this is the organizational effect Arun is speaking about? you might find this interesting. A very simple assumption. "The personal sunk cost fallacy likely has a different dynamic than the organizational sunk cost fallacy." It is probably the case that organizations have different ways to come to decisions because there are usually more people involved. Is that what you mean? Well, the whole point of Kahneman's book is that it is possible to guide your brain - to some extent. Basically, his argument is that normally everything works just fine spontaneously. But there are instances where, for one reason or the other, the spontaneous "insight" is wrong. He compares this to optical illusions, for example the Müller-Lyer illusion that you probably know. You cannot actually avoid optical illusions, they're too deeply ingrained in the way our brains work. But what you can do is recognize them and recall that they're illusions. As you probably just did. So if somebody goes and asks you which line segment is longer, you'll be able to say: I've seen this before, they don't look like it but they're the same length. A similar approach can work for other cognitive illusions, for example framing effects or anchors and so on. You can't really avoid them, but you can learn to recognize them and be careful with your conclusions. You say that the intuitions are a statistical assessment of past memories. That's true in a sloppy way, in that the brain tries to come to some conclusion from the memories. But what I'm saying is that this conclusion is not the correct one you would get if you'd do the statistics correctly. Let me give you a simple example. In your life you've met three people from, say, Austria, just to pick a random example. They were all grumpy and unfriendly. You're extrapolating that all Austrians are grumpy and unfriendly. What you are not computing is the probability that your sample is a statistical fluctuation, and the smaller the sample, the more likely is that. To make matters worse, it's a well established effect that people try to construct simple and coherent explanations, so the first Austrian you ever met probably shaded your whole expectations about Austria and Austrians. Not proper statistics. There are many other examples in Kahneman's book. For example that, if you have a completely random series, your brain will over-estimate the correlations and construct causal explanations even if they're not present. He spends a whole chapter explaining that people who trade stocks believe they know how the market works even after you tell them that their gains and losses are to excellent precision statistically distributed and uncorrelated, that it doesn't matter at all what they "know", they could as well do random picks. Sorry, typing on the iPad is slow, and I tend to be telegraphic. A person may want to persevere on in something for a variety of personal reasons. In an organization, however, admission of failure means heads must roll, and so admissions of failure are rare. This results in throwing in good money after bad. 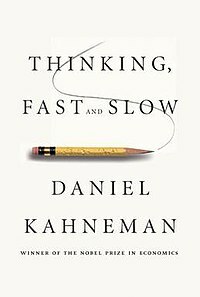 Bee writes to Goitis:Well, the whole point of Kahneman's book is that it is possible to guide your brain - to some extent. Bee:He spends a whole chapter explaining that people who trade stocks believe they know how the market works even after you tell them that their gains and losses are to excellent precision statistically distributed and uncorrelated, that it doesn't matter at all what they "know", they could as well do random picks. In organizations, failure is always a blame game. The options for an individual to decide to change are many more. Boredom is one. Having learned something is another. etc. This regrettable sentence suggests a designer. Apparently the reviewer, and the author, overlooked this comment and by the way, the concepts of evolution. A better sentence could be something like “ the brain’s structure of humans and other vertebrates (would be very useful to specify the taxonomical realm of the assertion) give priority to “bad” news… (also needed a definition of bad). "This regrettable sentence suggests a designer." No, it doesn't. A mechanism can certainly evolve. "Mechanism" doesn't imply a designer any more than "structure" does.